Dan Lubrano moves from machine to machine in his advanced manufacturing class at Gateway Technical College in Racine. The class is set up as an open lab. Students can use anything from protractors to computer programs. The tools teach them everything from the basics of electrical circuits to robotics. Lubrano, 32, is soft spoken. He has two arm-length tattoos. One says "Lubrano" in old-English lettering. On his other arm, in the same lettering, is the name of his daughter, Ariana. Last year, Lubrano saw a billboard for Gateway's new advanced manufacturing degree while driving in his hometown of Racine. It was one of two degrees the school developed for Foxconn Technology Group. The other degree is called supply chain management. There are currently 50 students enrolled in both degree programs. When Lubrano graduated from Park High School he wasn’t thinking much about his future. After spending about eight years working in retail and at fast food jobs, Lubrano got a job at Thermal Transfer Products in Racine. "Yeah, I wasn’t really goal orientated at the time," he said. "Unfortunately, you kind of have to put your hands to work and make a living. That’s what I did. I just found a job and I actually became pretty interested in it, over time." Lubrano is hoping what he learns at Gateway will teach him enough to quit his current job. Maybe it will lead to a job at Foxconn. Or maybe it will lead to a position with another manufacturer in southeastern Wisconsin. If Lubrano chooses the right vocation, he could even land a six-figure salary. No company has made more promises to Wisconsin's potential workforce than Foxconn. The company is planning to build a $10 billion dollar, 20-million-square-foot manufacturing complex just east of Interstate-94 in Racine County. An agreement between the company and Gateway, signed in early 2018, states Foxconn will hire 236 people skilled in advance manufacturing and 46 supply chain management graduates by year five. As part Foxconn's deal with the state, the company doesn't have to report how many people it has hired until April 2019. Tony Lestan spent 25 years working with large manufacturers in Milwaukee and Racine. 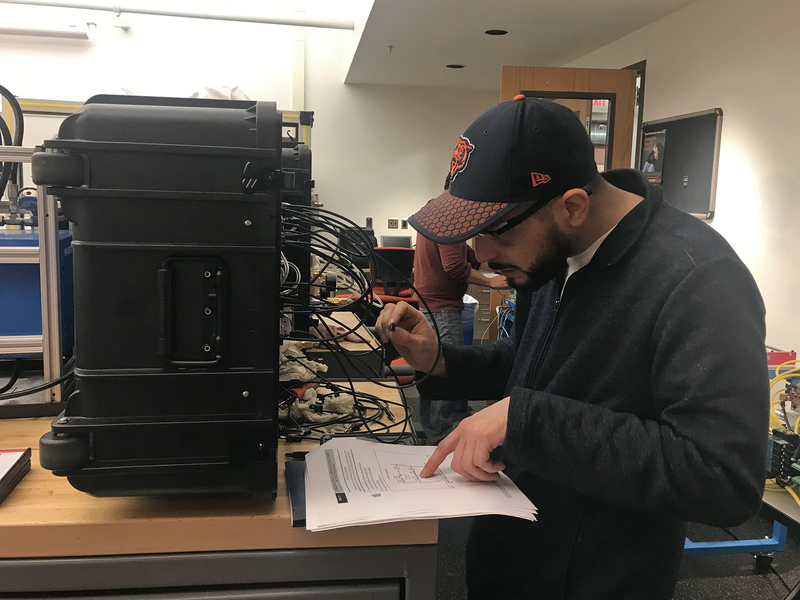 He became a full-time instructor at Gateway in mid-2018 as a way to give back to the industry he spent his career in. "We had a lot of trouble finding personnel, even at the elevated salaries," Lestan said. "So when the opportunity came up to fill the gap, I felt that I owed it to people. It really elevates people’s standard of living to get that better salary and learn the skills we really need right now." Foxconn drew Amber Heieren to Gateway. The 31-year-old has been driving a fork lift at a company in Racine for the last several years. She originally thought she would work on the production line. But now she's thinking about a career in engineering. "I decided to go behind the scenes and work more with my brain than my body," Heieren said. "I really don’t know what to expect. It’s kind of a learning curve." Heieren's not sure where she'll end up working. And Foxconn's plans for hiring have been fluid. But Lestan said even if his students aren’t hired by Foxconn, they will have no trouble finding jobs at other manufacturing companies in the state.